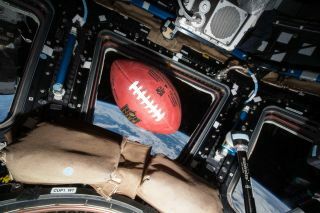 A football floats in microgravity, high above the Earth. Advice from an astronaut might have helped Green Bay Packers quarterback Aaron Rodgers perfect his Hail Mary technique. Rodgers is the modern master of this long-distance desperation heave: He's thrown three Hail Mary touchdown passes in the past 13 months, including one at the end of the first half last week, in the Packers' first-round playoff victory over the New York Giants. Rodgers and his teammates have said he tends to throw his Hail Mary passes higher than other quarterbacks do — a strategy that former NASA astronaut Mark Kelly, a veteran of four space shuttle missions, might have helped him devise. Retired NASA astronaut Mark Kelly, seen here before the launch of the STS-108 space shuttle mission in 2001. Kelly, Rodgers and entrepreneur Kevin O'Leary competed on the game show "Celebrity Jeopardy! "; their episode aired in May 2015. (Rodgers came out on top, winning $50,000 for charity.) After getting to know Kelly, Rodgers picked the astronaut's brain about Hail Mary physics, according to Sports Illustrated. "Kelly says — and Rodgers confirms — that they discussed height and trajectory and factors such as wind and cold. This was heavy conversation for a round of golf," Sports Illustrated reported today (Jan. 13). "His Hail Mary passes are like a spaceship re-entering orbit," Kelly told Sports Illustrated. "We should start calling it the 'Hail Rodgers.'" "Timing is everything, and fortunately, it is so cold in Green Bay there isn't significant re-entry heating," Kelly added. "I'm kidding, of course." Kelly flew his space shuttle missions in 2001, 2006, 2008 and 2011. The 2011 flight, which he commanded, was the final mission of the shuttle Endeavour. Mark Kelly's identical twin brother, Scott, is also a former NASA astronaut. Scott Kelly, along with cosmonaut Mikhail Kornienko, recently flew the first-ever yearlong mission aboard the International Space Station. Mark Kelly participated in this mission as well, albeit from the ground; Mark has provided researchers with biological samples to help them gauge how long-duration spaceflight might have affected Scott's DNA. Mark Kelly retired from NASA's astronaut corps in 2011, and Scott followed suit in 2016.